Walk past the corner of Barton and 10th Street in Arlington, VA and you’ll see an assortment of vegetables growing just outside the fence of a sprawling community garden. These vegetables are part of an area-wide program called Plot Against Hunger, which gathers fresh produce from area farmers, farmer’s markets, and private and community gardens to help feed the area’s hungry. Inspiration for the idea came to Lisa Crye when she saw the approach a church in California took to feeding the hungry: sell produce from members’ gardens and donate the proceeds to a local food pantry. At around the same time, the Arlington Food Assistance Center (AFAC) was looking for a way to offer more fresh vegetables to the approximately 1,400 needy families it serves in the County. So in a brainstorming session in 2007, Crye and Puwen Lee, AFAC’s volunteer service coordinator, hatched a plan that would grow into AFAC’s Plot Against Hunger program. Plot Against Hunger now provides AFAC with fresh produce from area farmers, farmer’s markets, and private and community gardens. In its first year, it contributed 10,000 pounds of fresh produce to AFAC’s warehouses. Since then, the number has grown dramatically, with Crye estimating that all the sources combined have yielded 200,000 pounds of produce each year. The program’s largest source of produce comes from harvesting excess vegetables from commercial farms in the area, a practice called “gleaning.” Plot Against Hunger coordinates gleaning events through the Mid-Atlantic Gleaning Network (MAGNET), which has relationships with area farms. The organization also gleans excess produce from the USDA’s Beltsville Agricultural Research Center in Maryland. Its second-largest source is unsold produce donated by vendors after the weekly Crystal City, Courthouse, and Columbia Pike farmer’s markets that otherwise might go to waste. 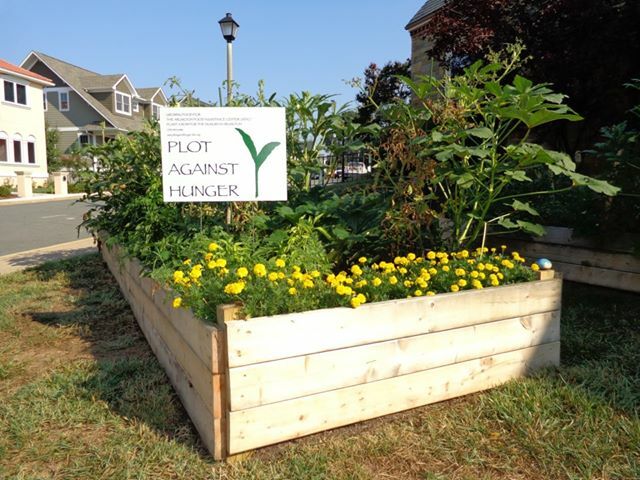 Plot Against Hunger also receives donations of vegetables grown in gardens across Arlington. Many county community gardens, such as the one at Barton and North 10th St. have plots dedicated to AFAC, as do gardens at faith-based institutions, schools, and private residences. But Plot Against Hunger does more than provide fresh produce to AFAC and, in turn, to the tables of its clients. It also educates Arlington residents on how they can grow their own vegetables. The food-producing garden at Arlington Central Library, for example, employs techniques that can be used to grow food in a wide range of conditions, such as raised beds, square-foot gardening (using small, densely-planted plots), and roof gardening. The garden at Clarendon Presbyterian Church employs straw-bale gardening, and alone yielded 125 pounds of produce for AFAC last year. Plot Against Hunger also has a school program. Several area elementary schools have gardens that contribute to AFAC while also giving students a hands-on learning experience in gardening. In Crye’s experience, kids who have been exposed to gardening and seen vegetables being grown are more likely to, well, eat their vegetables. Crye reported an anecdote of a child with a long history of broccoli-hating being mesmerized by an actual broccoli plant. AFAC and Plot Against Hunger don’t get to choose what vegetables are gleaned or donated. But AFAC operates on a “choice model” – its clients can select the food they wish to receive. Foods grown through local gardens or commercial farms don’t always line up completely with the food preferences of AFAC’s clients, who hail from a wide variety of backgrounds. So what to do when trying to place Swiss Chard, or blue hubbard squash – a massive, grayish relative of the pumpkin – with families who have no idea what to do with them? AFAC teaches its clients about these vegetables and how they can be prepared. Twice a week, AFAC holds cooking demonstrations and offers samples to clients. Want to get involved? AFAC and Plot Against Hunger are always looking for more volunteers, so whether you’re interested in gleaning, growing, cooking, or just donating produce, you can learn more here.